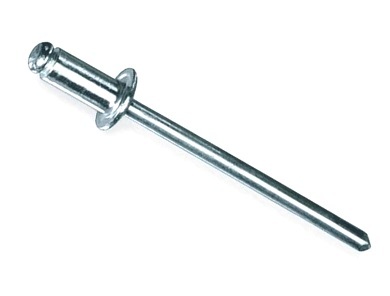 PRODUCT: 3/16 x .1875 - 0.250" (3/16 - 1/4") GRIP, ALL STAINLESS STEEL BODY/MANDREL, BUTTON HEAD (OPEN/DOME), BLIND POP RIVETS. PRICE/100. 304 STAINLESS STEEL BODY / 304 STAINLESS MANDREL. These All Stainless Steel High-shear blind rivets are the strongest stainless steel and have superior long term reliability. The rivet body and mandrel are meet or exceed IFI 114, Grade 51 specifications. Diameter: 1/8, 5/32, 3/16, 1/4"
Grip Range: 1/32 up to 1"